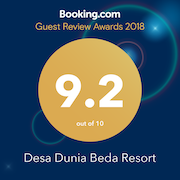 Desa Dunia Beda means in English a different world village and has an unique identity among Lombok's Hotel and Resort. Established in 2004, we offer ethnic luxury experience to our guests. Built on 15,000 m² land and an exceptional 170 linear meters of beach front at Gili Trawangan, we opted for traditional constructions from Java named Joglo and Rumah Kampung , old teak houses renovated. With only twelve villas on the property, our concept is to give full privacy, comfort and space to our guest. Gili is located just off the northwest tip of Lombok, Indonesia. There are various way to reach Gili, from the slowest, public ferries to the fastest and most luxurious, private charters. From Bali or Lombok Island, you can book fast boat to get to Gili. From Bali you can get a ride on fast boat from Amed or Padang Bai.